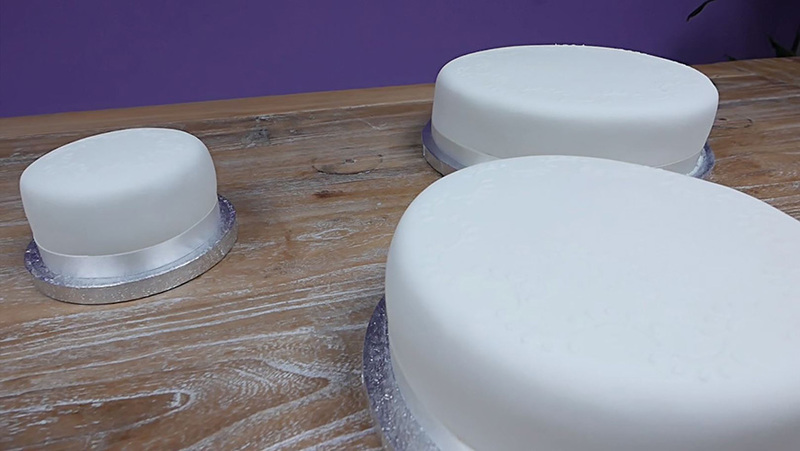 This video is full of budget-friendly wedding cake ideas so sit back and enjoy! Wedding cakes are a mouth-watering and beautiful addition to any wedding day and have been a tradition for centuries. These towering works of baked perfection can often come with a hefty price tag though but fear not; your cake doesn't have to cost the earth! We've made a little video that is packed full of DIY wedding cake ideas that all come in at less than £100, which could save you a small fortune! The best part about it; it wasn't even that much hard work. We bought three tiers of plain white wedding cake from Marks and Spencer and saved ourselves the hassle and pressure of baking our own. Then we challenged some of our amazing wedding venue specialists with the task of decorating the cakes in a range of different styles while keeping an eye on the cost. We wanted to show you all just how easy it to save a bit of money and create something that's personal to you in the process, so we got creative and conjured up some amazing wedding cake ideas to inspire you to do the same. We enlisted the help of expert videographers, Perfect Day Production to film the day and capture all the fun! There are some great choices of supermarket wedding cakes out there, and we decided to go with three tiers of Marks and Spencer's Traditional Wedding Cake. We ordered a large, medium and small tier that would serve up to 70 guests by M&S's reckoning and only cost us £54 altogether. There is an extra-large tier available too so you can cater for even more guests if you need too. You can choose between sponge cake, chocolate or traditional fruit cake, but as sponge cake was the clear office favourite, we decided to go for that! 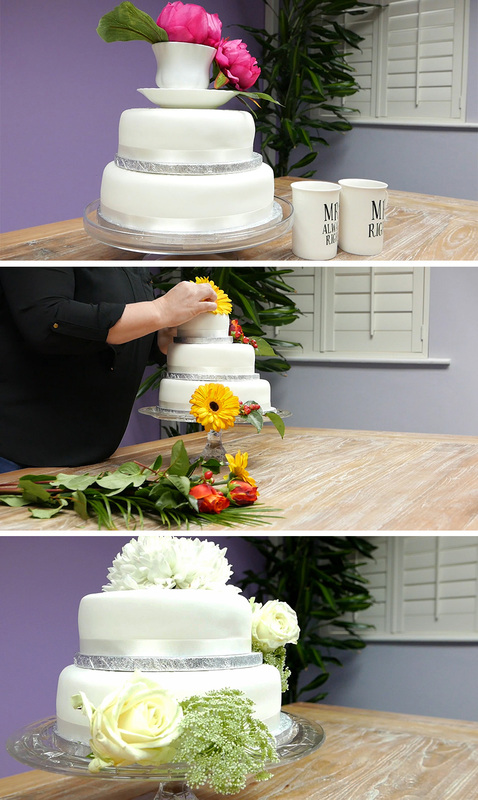 Sabrina was first up with her DIY wedding cake ideas, and she brought in two bouquets of fresh flowers, a bunch of artificial flowers and some cute tea cups and mugs for a quirky design. We used the decorations for three different cake styles, that could easily be interchanged and mixed together to create a colourful and quintessentially English look. There were plenty of flowers and more than enough left over so it would be the perfect for decorating a larger cake or the table where your cake will stand too. See how Sabrina created her DIY wedding cakes here. Rory was next and wanted to go for something fun and unusual with his design. He borrowed an awesome collection of Lego Minifigures and a few props from a friend who's got an amazing Lego Instagram thing going on (trust us, you'll definitely want to check James. R out) to decorate his cake. This style was all about entertaining your guests, and we think it portrays perhaps the most fun wedding party ever! Lego is easy to get hold of on the high street, and we found a bride and groom on Ebay for as little as £6. See how we did it here. Jenny had some amazing decorations with her and got creative to give her design extra height and wow factor. She spent £12 on these beautiful flowers and £11 on the rest of the decorations to create this breathtaking DIY wedding cake. We were amazed that you could do something this good for such a small price! Jenny brought the white ceramic cake stand in from home, but even with this price factored in, it would still only set you back £90. Kate decided on a rustic country look for her DIY wedding cake, and it fitted the brief from top to bottom. 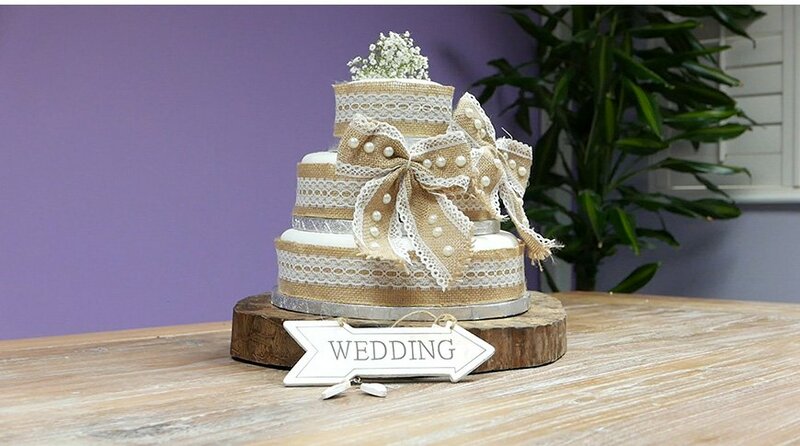 She bought the tree trunk cake stand from home (although we've seen ones on Etsy for about £10) and used hessian and lace to surround the cake and to form cute little rustic bows. It's topped off with a sprig of gypsophila and amazing price tag of only £72 too! See how Kate created the cake here. 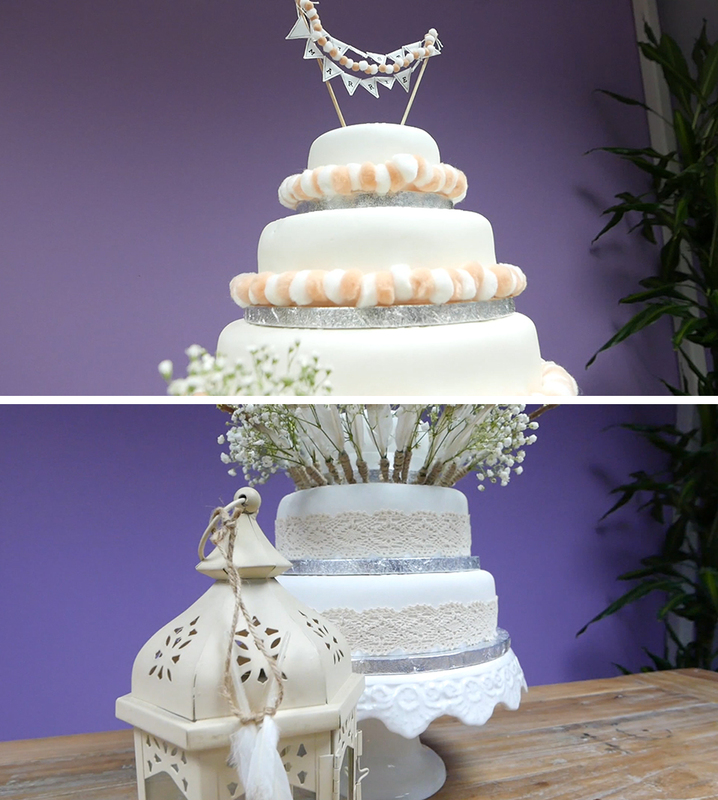 Charlotte brought her incredible crafty skills to the table and created two DIY wedding cake ideas with two different styles that definitely caught the eye. She used pompom garlands (and cute mini pompoms too) with some tiny ‘Just Married' bunting on top. For the second cake, she sprayed and glittered the tips of feathers, then attached sprigs of gypsophila and a cocktail stick to each one. They only took just over an hour to create and the result was stunning! See how Charlotte did both of these here. There are so many DIY wedding cake ideas to pick from and plenty of styles to suit any type of wedding, so find some ideas and get creative! 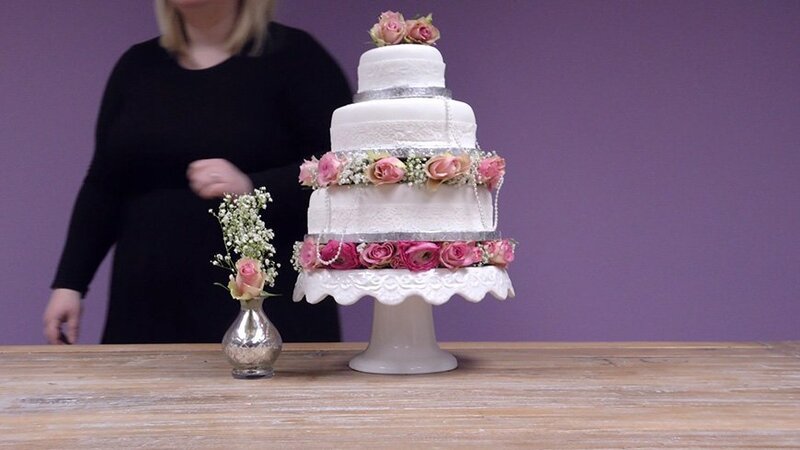 We hope our video gives you all the inspiration you need to design your beautiful budget wedding cake; we certainly had a great time filming it (and eating all the cake afterwards)! Don't forget to check out how we went about creating each different style, and most importantly, how much our decorations cost and where we got them from! A massive thank you to Perfect Day Production for creating this amazing video for us, to James. R for all the Lego, and to all our team who got stuck in and made these wonderful DIY wedding cakes! 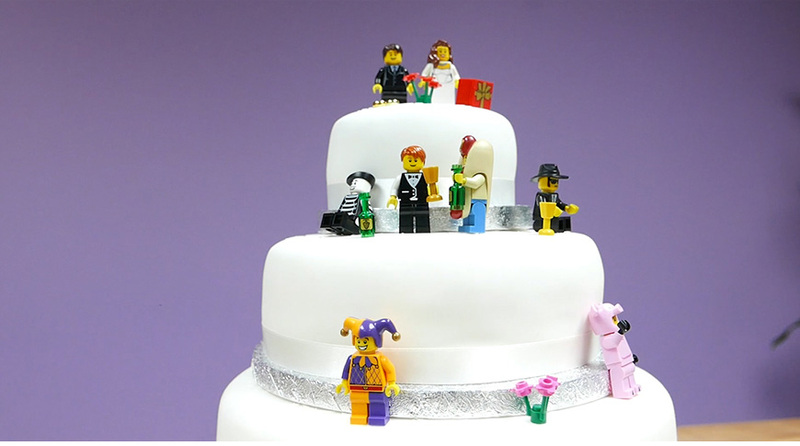 Creating A DIY Wedding Cake With… Lego!